This image was created on the St. Augustine Alligator Farm IPT on a mostly sunny early morning with the Canon EF 200-400mm f/4L IS USM Lens with Internal 1.4x Extender (hand held with the internal TC in place at 560mm) and the Canon EOS-1D X. ISO 400. Evaluative metering +1/3 stop as framed: 1/160 sec. at f/10 in Av mode. AWB. 61-Point/AI Servo/Rear Focus AF active at the moment of exposure performed perfectly selecting a tight cluster of sensors on the bird’s upper bill. Learning which AF Area Selection mode to use in different situations helps you maximize the efficiency of the great AF systems of the 1D X and 5D III. Learn everything that I know about the various AF Area Selection Modes, when to use which one, several ways to move the AF sensor, and tons more in the 1D X AF Guide and the 5D Mark III User’s Guide. Click here to see the latest version of the Rear Focus Tutorial. Click on the image to see a larger version. . I have three problems with this image. If you think that you know what any of them are, please feel free to leave a comment. I will respond. Co-leader Denise Ippolito and I were joined by the very pleasant Catherine Costolo of Atlanta. With 2 great leaders and only 1 participant she was in learner’s heaven. St. Augustine this year was very much about spoonbills. Their were courting pairs right next to the boardwalk, fledged but not flying young, and half-grown and tiny chicks in many nests. As spoonbills tend to nest in well protected situations photographing the smalls chicks was close to an impossible task. As is expected at St. Augustine, there were lots of flight photography opportunities especially in the afternoon. There were lots of nesting Wood Storks, Tricolored Herons, and Snowy Egrets. Cattle Egrets were in short supply and those that were nesting were totally buried. 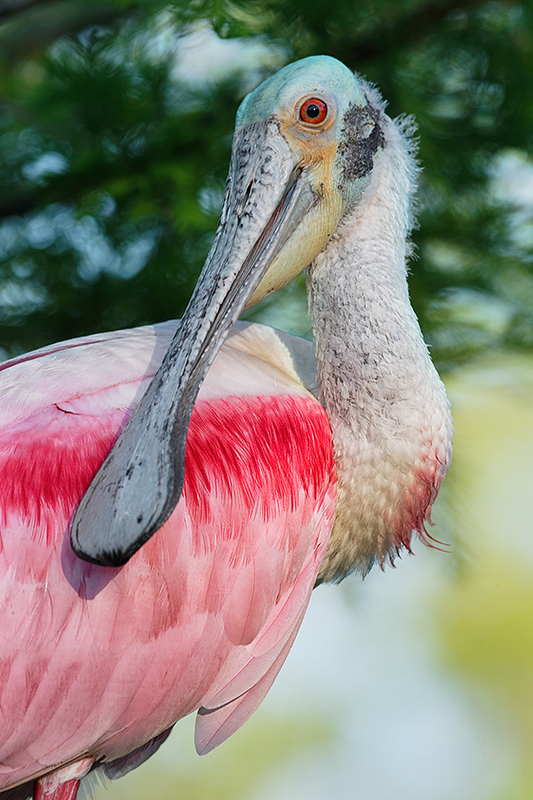 You can learn more about conditions at St. Augustine and check out one of my all time favorite images in the “The New Essence of the St. Augustine Alligator Farm: Roseate SpoonBILL” blog post by clicking here. This image was also created on the St. Augustine Alligator Farm IPT, this one at 8pm with the hand held Canon EF 300mm f/2.8L IS II USM lens, the Canon Extender EF 1.4X III, and the Canon EOS-1D X. ISO 1600. Evaluative metering at zero: 1/4000 sec. at f/3 in Av mode. AWB. 61-Point/AI Servo/Rear Focus AF active at the moment of exposure performed perfectly selecting a tight cluster of 3 sensors in the upper right-hand corner of the grid the fell on the middle of the the bird’s bill as framed. Learning which AF Area Selection mode to use in different situations helps you maximize the efficiency of the great AF systems of the 1D X and 5D III. Learn everything that I know about the various AF Area Selection Modes, when to use which one, several ways to move the AF sensor, and tons more in the 1D X AF Guide and the 5D Mark III User’s Guide. Click here to see the latest version of the Rear Focus Tutorial. Click on the image to see a larger version. Don’t ask me why ISO 1600. Don’t ask me why 1/4000 sec. Don’t ask me why “at zero.” I am not sure why I screwed all of those up so badly, but I was thinking creatively at the time. I knew that there was a good silhouette there despite the fact that there was no strong backlight at all. I did most of the dirty work during the RAW conversion in DPP and put the finishing touches on the B&W look with a Levels Adjustment in Photoshop 6. You can learn of a dramatic rescue of baby spoonbills at the St. Augustine Alligator Farm by clicking here. To learn why I use Canon’s Digital Photo Professional (DPP) to convert every image that I work on, click here. To convert this originally boring image I went to +.33 on the Brightness adjustment, +2 with the Contrast slider, +5 with the Highlight Slider, and -5 with the Shadow slider. And I set Peripheral illumination on the Lens Aberration correction tab to 100 to eliminate the expected vignetting. I have never even tried that before but it worked perfectly. 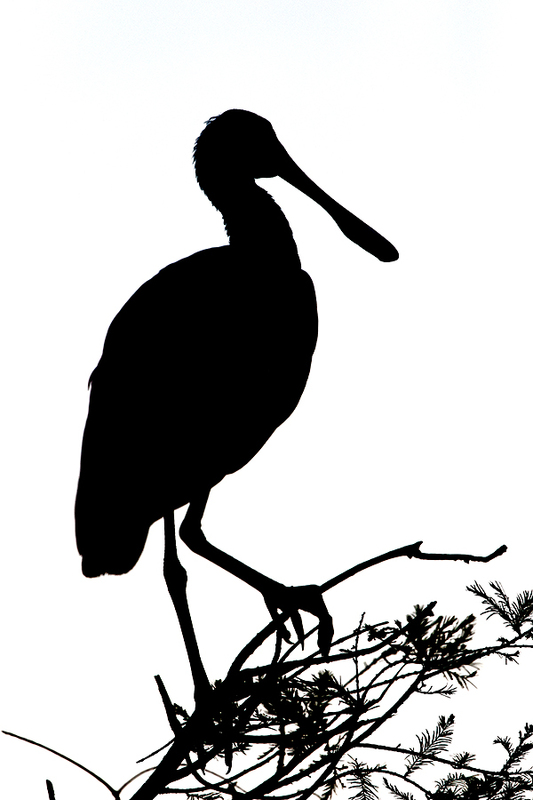 Everything that I did to optimize the spoonbill silouette in Photoshop is detailed in my Digital Basics File–written in my easy-to-follow, easy-to-understand style. Are you tired of making your images look worse in Photoshop? Digital Basics File is an instructional PDF that is sent via e-mail. It includes my complete digital workflow, dozens of great Photoshop tips, the use of Contrast Masks, several different ways of expanding and filling in canvas, all of my time-saving Keyboard Shortcuts, Quick Masking, Layer Masking, and NIK Color Efex Pro basics, my killer image clean-up techniques, Digital Eye Doctor, creating time-saving actions, and lots more. Though the weather was sunny with blue skies; we never saw a cloud until the last afternoon. Many would think that these were perfect conditions but the wind directions made things extremely difficult: west winds in the mornings and east winds in the afternoons found the birds landing, taking off, and facing away from us and the light (with the sun properly at our backs….) None-the-less Catherine learned a ton and we all made lots of great images. Food at the Gyspy Cab Company was superb as usual; both the Bahamian Clam Chowder and the Cod Santa Cruz were amazingly delicious. The latter was not on the menu every day but it is worth asking for. They always made it for me upon request. This image was created on the Fort DeSoto IPT at 5:45pm on a bright sunny afternoon with the Gitzo 3532 LS carbon fiber tripod, the Mongoose M3.6 head, the Canon EF 600mm f/4L IS II USM lens, the Canon Extender EF 2X III, and the Canon EOS-1D X. ISO 400. Evaluative metering +1/3 stop as framed: 1/1000 sec. at f/11 in Av mode. AWB. Central Sensor (by necessity)/Expand/AI Servo/Rear Focus AF just above the bend of the wing was active at the moment of exposure. When I add the 2XIII TC to an f/4 lens with the 1DX or the 5D III I hit the MFn button once to toggle to AF Expand and enjoy 4 extra AF sensors with Expand. Learn everything there is to know about the 1D X and 5D III AF systems including how to manage the various AF Area Selection Modes, when to use which one, and several ways to move the AF sensor around in the 1D X AF Guide and the 5D Mark III User’s Guide. Click here to see the latest version of the Rear Focus Tutorial. Click on the image to see a larger version. As Denise had a private client, BAA-friend and multiple IPT veteran Brent Bridges, I was technically the sole leader on this IPT. I was joined by Mary Anderson of Fairway, KS, a suburb of Kansas City. Mary, a professed beginning photographer, showed up with a 200-400 with Internal Extender and a 1D X…. She was a nice as could be–she cleaned the love bugs off the windshield when I stopped for gas of her own free will and volition–and she was very eager to learn. She asked a ton of questions. And got them all answered in spades. It seemed that she best absorbed the lessons as we chatted on our drives to and from the park. As it turned out, the two small groups, Denise and Brent and Mary and I, spent a good deal of time together in the field, often photographing the same birds. It was fun and mutually beneficial. See more on Denise as a co-leader below. I had heard a report that there “were no birds at DeSoto, especially on weekends.” That did not turn out to be the case at all. 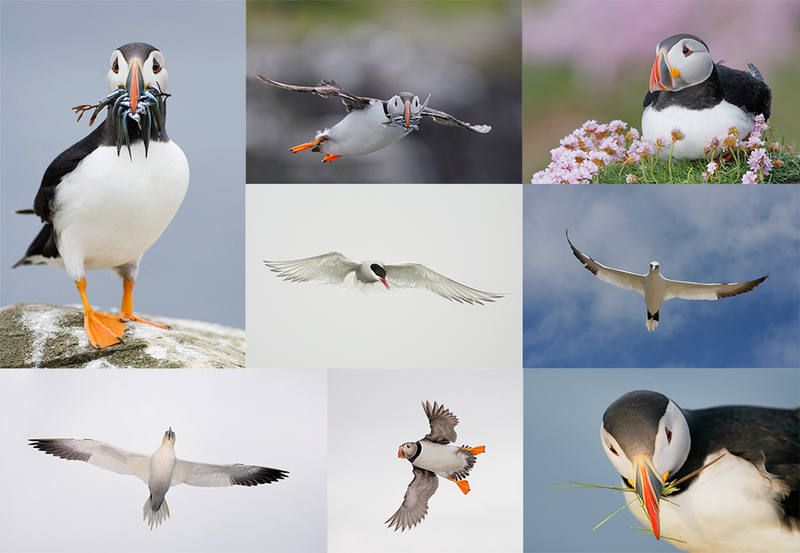 Though there were surely fewer birds than you would typically expect in spring, and though we saw a grand total of 1 Royal Tern on the beach where large flocks would normally be expected, we enjoyed high quality virtually non-stop photographic opportunities. The subjects? Laughing Gulls. Great Blue Heron. (See “The Amazing Canon 300mm F/2.8L IS USM Lens/Part I of a Series: The Prime Lens Alone” for some great stuff on those two species.) Many species of shorebirds including Black-bellied Plover, Dunlin, Short-billed Dowitcher, Sanderling (see “A Single Day on the Fort DeSoto IPT: One thousand nine hundred sixty one images/Three hundred forty three Keepers), Willet, Ruddy Turnstone, Semipalmated Plover, Wilson’s Plover, and two highly desirable species, Marbled Godwit and American Oystercatcher. On our last afternoon we killed on Reddish Egret and Tricolored Heron in mega-breeding plumage. We did great on nesting Least Terns and with a Yellow-crowned Night-Heron in one of the exact spots noted in the Fort DeSoto Site Guide. See two great yellow-crowned images in the “Teleconvrrter Versatility” blog post here. We encountered several ridiculously tame Common Mergansers, a few Snowy Egrets, and a Great Egret or two. And more than a few White Ibises. There will be lots more DeSoto images on the blog in the coming weeks. This image was also created on the DeSoto IPT, this one on a cloudy morning 8pm with the hand held Canon EF 300mm f/2.8L IS II USM lens, the Canon Extender EF 2X III, and the Canon EOS-1D X. ISO 800. Evaluative metering +2/3 stop: 1/640 sec. at f/10 in Av mode. AWB. One sensor to the right of the Central Sensor/AI Servo Surround/Rear Focus AF squarely on the front bird’s breast was active at the moment of exposure. Learning which AF Area Selection mode to use in different situations helps you maximize the efficiency of the great AF systems of the 1D X and 5D III. Learn everything that I know about the various AF Area Selection Modes, when to use which one, several ways to move the AF sensor, and tons more in the 1D X AF Guide and the 5D Mark III User’s Guide. Click here to see the latest version of the Rear Focus Tutorial. Click on the image to see a larger version. Join in the fun by voting on the Digital Creations Category of the BIRDS AS ART 2nd International Bird Photography Competition by clicking here. As with the Pleasing Blurs category, the public vote in Digital Creations bears little to no resemblance to the results of the judges voting. It seems likely that this will be the secoond category in which the public’s favorite will not match the judge’s first choice. Thirteen strong images made it to the final round in this category. Do take a peek. A Creative Adventure/BIRDS AS ART friend Kitto Kono sold her Nikon 500 to a Blog subscriber in less than a week. Janet Horton’s 7D sold this week after a $100 price reduction and Doug Bolt’s sold for the asking price. Denise Ippolito’s 100-400 and her 100 macro sold in one day. Peter Kes sold his 70-200 f/2.8L IS II and his 400 DO through BAA in ten days. In the past two months we have sold a Canon 800, a Canon 500 II, 3 400 DO lenses, a Nikon 500mm, and lots more. If you are interested in using our services, please e-mail. Eagle-eyed blog readers may have noticed that there is a link to the Used Photography Gear page on the yellow tool bar at the top of each blog page. Folks looking to buy (or to sell) can click on that tab or here. I will on occasion continue to list new gear and great buys in blog posts and in Bulletins and may on rare occasion share all the listings with you on the blog (as I have done below in this Bulletin. I will strive to keep the listings current. Great news for Kitty Kono and her Nikon 400mm f/2.8; it sold yesterday! That made her 2 for 2 on selling her older Nikon super-telephotos with BAA. Used Canon 100-400mm f/4.5-5.6L IS USM Lens for Sale/Price Reduced $300! Multiple IPT veteran Bill Wingfield is offering a Canon 100-400mm f/4.5-5.6L IS USM lens in excellent condition for $1125! The glass is clean and the lens is in perfect working condition. The sale includes the lens hood, the fabric case, and insured shipping by UPS Ground to US addresses only. Personal checks only; your new lens will be shipped after your check clears. BAA friend Nancy Bell is offering a used Canon EOS-1D Mark IV camera body for sale for $3200. The body is in excellent condition. It enjoyed annual routine cleaning and service at a Canon Factory Service Center; the last one was done on 5/30/13. The sale includes the original box, battery charger, 3 Canon batteries, the instruction manual, all connection cables, a Canon neck strap, and insured Fed-Ex Ground shipping to US addresses only. Payment by personal or teller’s check; the item will ship item only after the check clears. Please contact Nancy via e-mail or by phone at 970-484-8791–Colorado, MDT. BAA friend Nancy Bell is also offering a used Canon 400mm f/4 DO IS USM lens for sale for only $4499. The lens is in very good to excellent condition with some minor blemishes on the exterior finish and some signs of wear on lens hood interior rim. The glass is perfect and he lens is both light and sharp. The last yearly routine cleaning and service at a Canon Factory Service Center was on 5/30/13. The sale includes the leather lens hood, the lens trunk, and insured Fed-Ex Ground shipping to US addresses only. Desperately needed: 1 female roommate. Call or e-mail for female roommate-needed discount info. Because of limited room availability the last day for a guy to register is this coming Thursday, May 22. 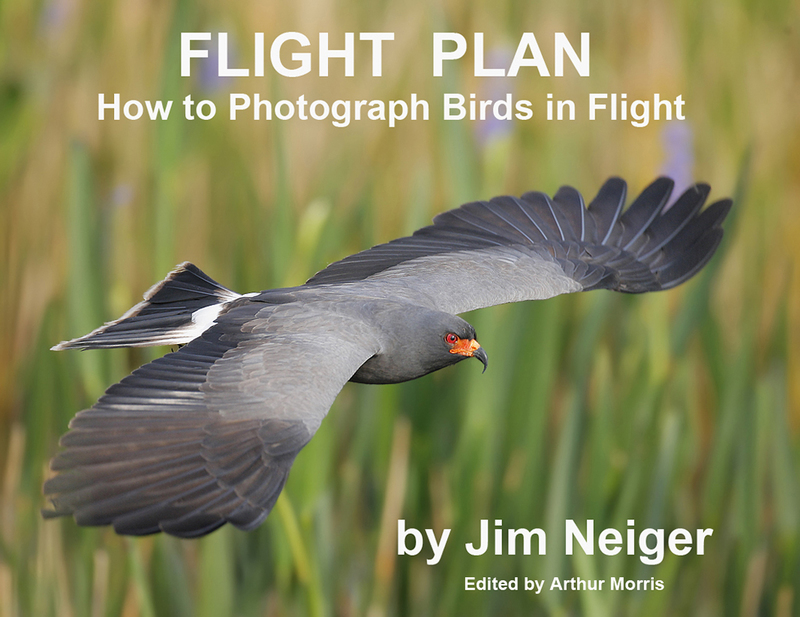 Join Veolia-BBC award-winning photographers, Jim Neiger and Doug Brown, in July, 2014 for a workshop focusing on birds in flight. 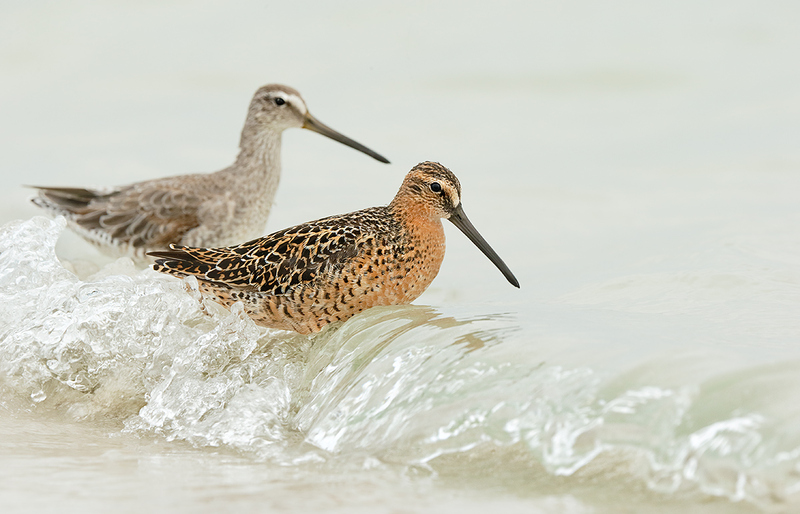 We’ve selected the area around Huntington Beach, California for its incredible number and variety of birds, not to mention the great weather! 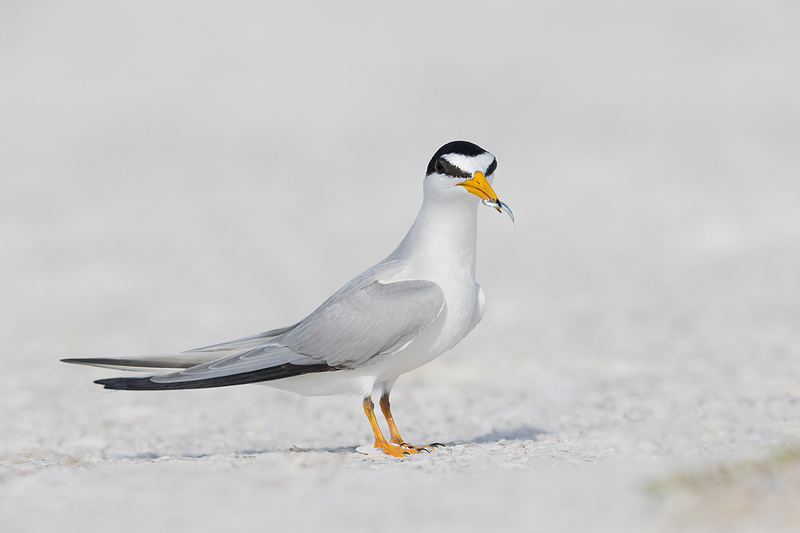 In July, Terns will number in the tens of thousands, and there should be no fewer than five different species (Elegant, Forster’s, Caspian, Royal, and Least). 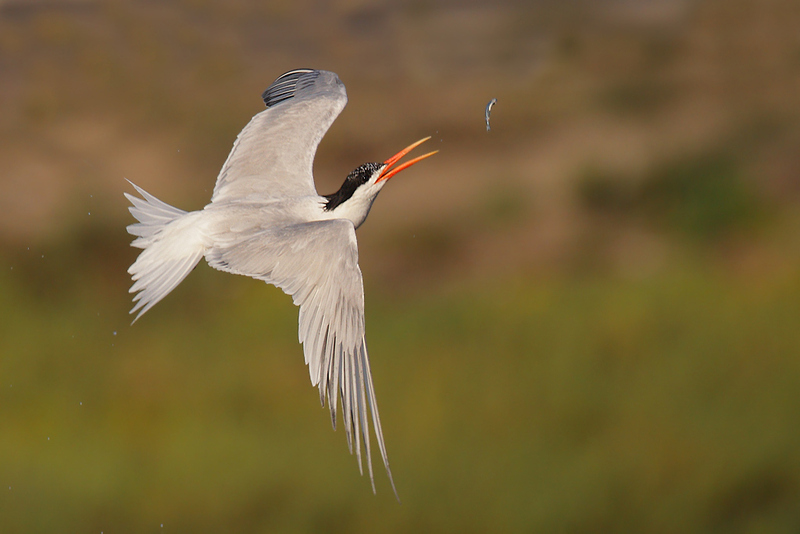 Black Skimmers, Pelicans, Egrets, Herons, and Gulls will all be plentiful. There will also be opportunities to photograph more challenging subjects such as raptors, Kingfishers, and shorebirds. These workshops are filled with non stop flight action. If you wish to learn the best techniques for photographing birds in flight, followed by unlimited opportunities to practice these techniques and develop the skills required to consistently photograph birds in flight, then this is the workshop for you. The focus of the workshops will be on mastering the hand held, long lens technique favored by both Jim and Doug. Manual exposure for birds in flight will also be emphasized. There will be an instructional lecture on the first day, followed by morning and afternoon sessions in the field for each of the next three days. As an added feature, you will have the opportunity to hone your Lightroom and Photoshop skills with Jim and Doug during the free time in between field sessions. The workshop will be limited to twelve participants; with two expert instructors available, everyone will receive plenty of individualized attention both in the field and the classroom. Workshop Cost and payment: The cost of each workshop is $1300 per person. Each workshop includes a half day formal classroom instruction session, a morning photography session, and an afternoon photography session, each of the remaining days. The photography sessions include personalized instruction in the field. A $650 non-refundable deposit is required for the workshops. The remaining $650 is due 30 days before the start date of the workshop. If you are unable to attend the workshop after paying the balance, the balance payment will be refunded ONLY if your spot can be filled on short notice from the waiting list. All workshop payments must be made by check or money order. Credit cards are not accepted. Learn about Jim’s Flight School Custom Anytime Workshops here. Thanks for commenting Ron. I like the o-o-f leaves and do not have any problems with the Bokeh. The white in the lower right is sky. That was one of the things that bugged me a bit. I am gonna make a blog post out of this as nobody really hit the nail on the head here and there are lots of valuable lessons here…. Not sure what your 3 problems are with the spoonbill image, but I suspect one of them is the busy background in the upper part of the image; it looks like trees with white sky poking through. And maybe it could use some bill cleanup. Not sure about #3. Thanks Loren. You have touched on one of the three things that bug me…. To be continued. I would say probably the two distracting diagonal branches behind the bird’s head, the yellow blur in the lower right, and if I really nit-pick then the shadow cast on the bird by it’s bill. Nice shot, though; maybe the difference between a good shot and a perfect shot. Some things are just beyond our control. I doubt you could have moved the camera enough to completely get he blurred branches out of the background since I suspect you were standing on the boardwalk, and with light overhead it’s impossible to completely avoid shadows.